L to R: Undergraduates: Jane Shmushkis, David Gordon, Mauricio Alvarez, Griffin Murphy, Kathryn Khaw, Sisanmofe Dorsu; Grad Student Mentors: Connor Woods, Aixi (Lexi) Zhang, Shawn Maguire, Katie Rose [not pictured, Evan Dolling]. Graduate Student Mentors: Evan Dolling, Katie Rose, Shawn Maguire, Connor Woods, Aixi Zhang. Synopsys: This collaborative project brings students from Schools of Engineering, Design, and Arts and Sciences to design tent prototypes that are coated with active coatings to divert and collect water. Importance, Background and Hypothesis. Natural disasters affect more than 200 million people annually, and their occurrence has been on a steady rise in the past several decades. For example, the frequency of natural disasters between 2000 and 2009 has increased by 300% compared to the preceding decade (Leaning et al., N Engl J Med 2013; 369:1836-1842). One immediate consequence of many natural disasters is that a significant number of people will be displaced from their own living spaces and forced to live in temporary shelters or tents, which often do not provide ideal living conditions due to the lack of clean water, sanitation and electricity. Providing power, sanitation, and clean water to the site of a natural disaster can be extremely challenging and expensive due to inaccessibility and weather conditions. Our hypothesis is that active coating technologies (ACTs) will impart natural disaster relief tents and shelters with properties and functionalities that are necessary to divert, collect and purify water, to prevent the transmission of infections and to convert and store solar energy. The primary objective of this summer undergraduate research group program is to take the first step toward such an ACT-enabled relief tent. 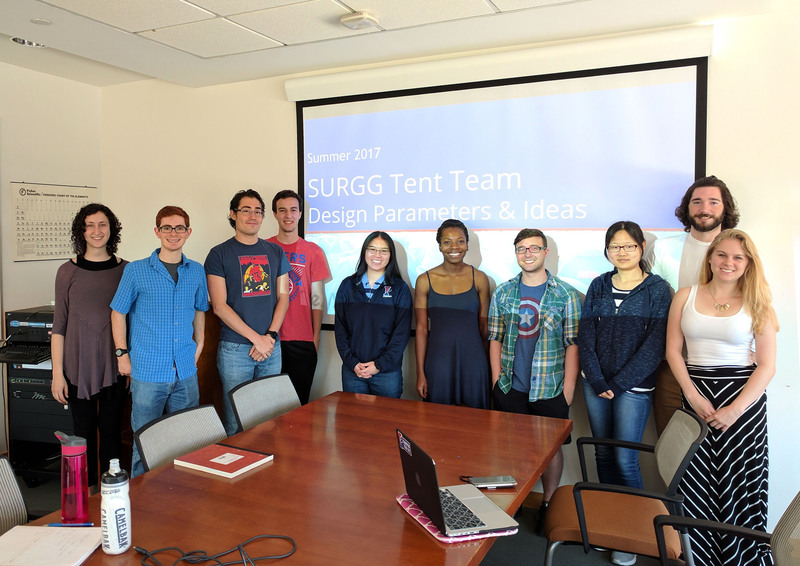 The undergraduate research group designs and develops scalable means to deployable tents that can divert and collect water by taking advantage of active coating technologies (ACTs) that have been developed by Penn researchers. Key Challenges and Our Methodology. Penn REACT researchers have made significant advances in manipulating the surface chemistry and structures at the nano-/micro-scales to impart water repellency. These surfaces can be further engineered to divert water for the purpose of water collection. 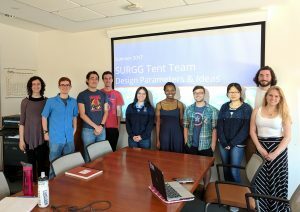 The SURGG design project aims to develop scalable fabrication techniques to translate ACTs to enable coating on large-area fabrics and fibers that will be used for relief tents and shelters. In particular, we explore scalable techniques that are widely used in industry such as spray coatings and roll-to-roll (R2R) printing technologies. For this summer, the undergraduate researcher team is focused on the scalable manufacturing of active coatings for water management – i.e., diversion and collection of water. This is an ideal project for a team of undergraduate students because active coatings for water management have already been developed in Penn research laboratories, and this project will focus on their large area implementation. Acknowledgments: ShelterBox USA provided a loaner tent and emergency response box, as well as expert advice on materials and real-world deployment scenarios.